In a large bowl, stir together whole wheat flour and baking powder. Cut in butter with a pastry tool or pinch in by hand until butter lumps are no larger than peas. Add honey, egg, and water, mix until the dough comes together into a ball. Roll out dough to 1/4 to 1/8 inch thickness. 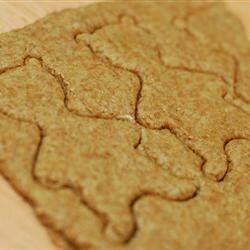 Cut into squares or with a cookie cutter. Place 1 inch apart on cookie sheet and bake 10 to 15 minutes or until edges are light brown. Good recipe. Cookies were cracker-like just as the recipe says. I used 1/2 of the honey, but still found the cookies super-sweet. 1/4 cup of honey would be plenty.